We've all seen them. Every magazine in the '70s and '80s used to feature the cheesy body building ads in the back of the magazine promising a new body in virtually no time at all in as little as 15 minutes a day. You see similar ads today promising the same thing only there are few difference. For one thing, the ads today do not feature a weakling that gets constantly bullied only to send away for the program, bulk up and then go back and beat the living crap out of the bully. Today the ads usually show someone who is overweight and has trouble zipping up their pants or just pear shaped in the worst way. They send for the program and instantly they have rock hard abs and killer buns of graphite (steel is so '80s). 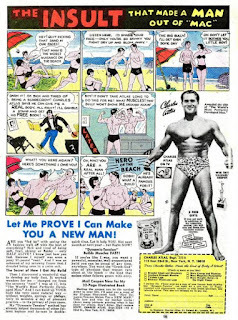 When I was younger I actually sent away for Charles Atlas's program and surprise surprise it was simply working out with weights. Nothing fancy, no expensive machines or gizmos - honest to goodness hard work and training was and is the only way to a more perfect body. Some things never change. Click here to see a collection of other vintage body building ads featuring a bunch of weaklings beating up bullies.